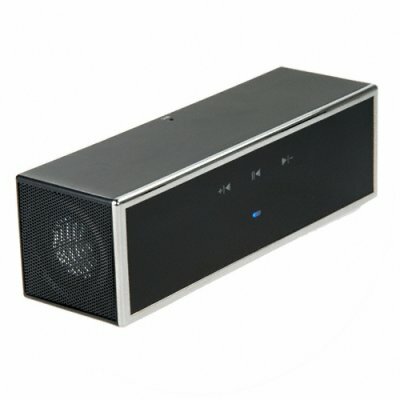 Successfully Added Bluetooth Portable Stereo Speaker - Super 2 x 2W Sound to your Shopping Cart. High def portable stereo speaker system with Bluetooth built in, for the best way to play the digital music from your phone or make Bluetooth calls from the comfort of your desk. Unique and useful, this Bluetooth system has a great feature set including; 2 x 2W speakers with 8Ohm impendence for crystal clear sound, Headset/Handsfree/A2DP/AVRCP native profiles, a built in MIC for making handsfree phone calls whenever it is paired to a Bluetooth phone, an 3.5mm audio line in for playing music directly from your iPod or computer, and a long lasting built in rechargeable battery with an astounding 200 hours standby time when paired with a phone. Perfectly sized, whether for fitting in your pocket or purse or sitting on your desktop, this Bluetooth stereo speaker is the perfect accessory for getting the most sound output from your music or calls for the least possible price. Want to do your loyal internet customers a favor and at the same time make yourself some nice dough? Then order stock of this little Bluetooth speaker, this model really is a useful little marvel. As always, brought to you by the original direct from China no M.O.Q. (no minimum order quantity) wholesaler, Chinavasion. Hi-def portable stereo speaker with Bluetooth for listening to music or making calls. Has a 3.5mm audio line-in for playing music directly from your iPod or computer.